The Battle of the Bulge, also called the Battle of the Ardennes ends. This battle had started on December 16, 1944. 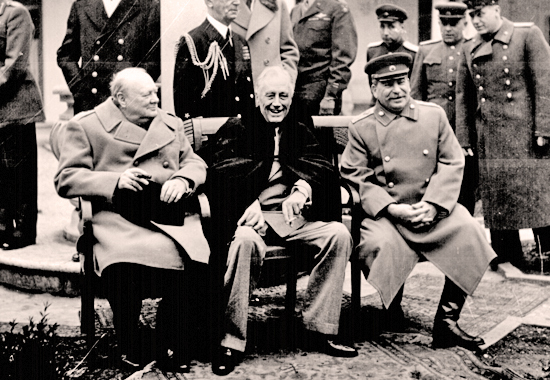 Churchill, Roosevelt, and Stalin meet at the Yalta Conference in the Crimea. The Battle for Iwo Jima starts. This battle will end on March 26, 1945. Marine Col. Dave Severance commands the company that will take Mount Suribachi. 1945, February 19: The Battle for Iwo Jima, February 19 - March 26, 1945. Allied Invasions of Iwo Jima and Okinawa (Operation Iceberg) 1945. Joe Rosenthal takes a picture, worth a Pulitzer. See also Iwo Jima - Mount Suribachi under WWII. Perhaps the most important artifacts in the care of the National Museum of the Marine Corps are the pair of original American flags raised by the Marines on Mount Suribachi on 23 February 1945. The attack transport Missoula donated the smaller flag, raised by the Schrier Patrol on the summit. Landing Ship Tank (LST) 779, then unloading at Green Beach, donated the larger flag, raised later in the day and portrayed in the famed Joe Rosenthal’s photograph. 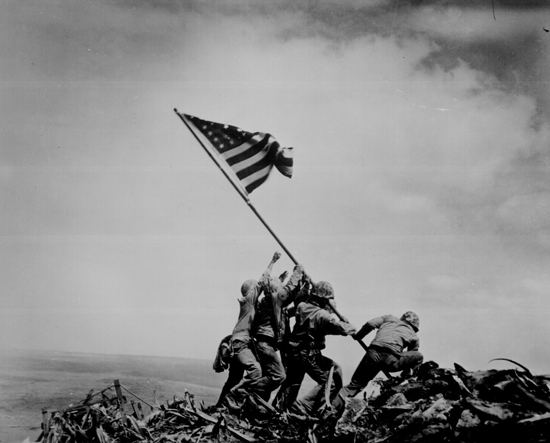 Frayed by strong winds, the second flag flew from Suribachi for the balance of the battle for Iwo Jima. To reduce exposure to harmful light, the two flags be displayed on a rotating basis. At all times, one of the two Mount Suribachi Flags will be on display at the National Museum of the Marine Corps. The Battle for Iwo Jima ends. This battle had started on February 19, 1945. The Battle for Berlin begins. Major carnage. This battle will end on May 2, 1945. Easter morning, T/5 William E. Thomas and Pfc. 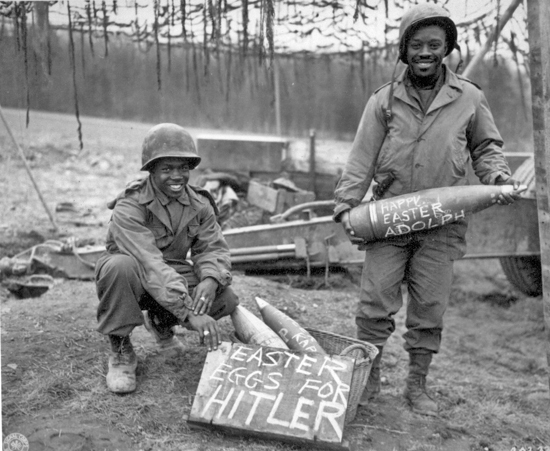 Joseph Jackson will roll specially prepared eggs on Hitler's lawn. The Battle for Berlin ends. This battle had started on April 16, 1945. Victory in Europe Day (VE-Day). Germany surrenders unconditionally. The Potsdam Conference commences. It will be concluded on August 2, 1945. The Potsdam Conference ends. It had begun on July 17, 1945. The US drops atomic bombs on Japan at Hiroshima. The U.S.S.R. declares war against Japan. The US drops atomic bombs on Japan at Nagasaki. Victory over Japan Day (VJ-Day). Japan surrenders.